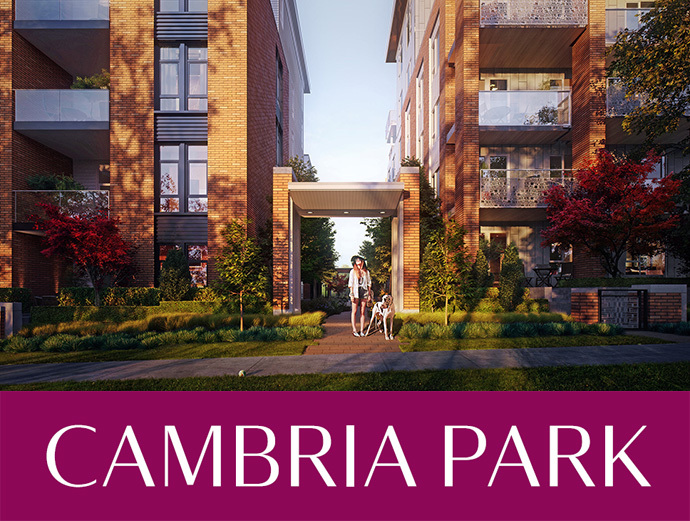 The West Side Vancouver Cambria Park homes by MOSAIC are coming Spring 2016! 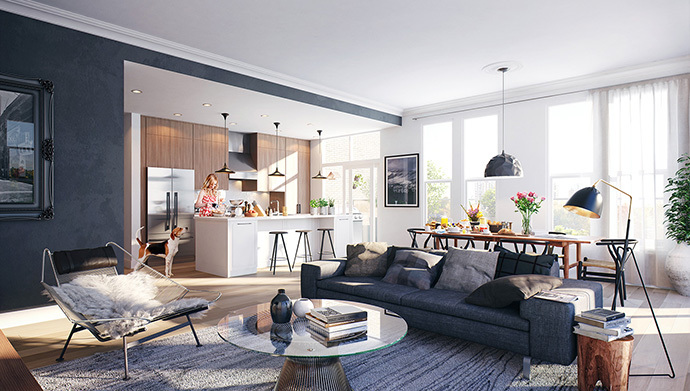 Located at Cambie & 64th Vancouver, the Cambria Park homes will feature two and three bedroom residences in one of the most prestigious and sought after neighbourhoods in the city. Grand city homes framed by parks on two sides, experienced through high-volume spaces and private outdoor living areas are waiting for the discerning home buyer this Spring. The outstanding Westside Vancouver neighbourhood features a close proximity to transit routes including the Canada SkyTrain Line (2 minutes to the Canada Line which takes you to downtown Vancouver in 14 minutes or to Richmond/YVR Airport within 13 minutes). You’re also just fifteen minutes to St. George’s School and 16 minutes to the University of British Columbia. The Cambria Park Vancouver homes are also next to Queen Elizabeth Park, VanDusen Botaincal Gardens, Langara Golf Course and Cambie Park. Other west side neighbourhood highlights include a close proximity to the T&T Supermarket, BC Children’s and Women’s Hospital, Marpole Oakridge Community Centre, YMCA (Langara), Vancouver College, Langara College, great elementary and secondary public schools, Oakridge Centre, Nat Bailey Stadium, Hillcrest Community Centre and Vancouver Olympic Centre. The actual site location for the West Side Vancouver Cambria Park by MOSAIC Homes is at Cambie and 64th. More information is online at www.mosaichomes.com. The project is divided into two buildings: Boulevard Homes (facing Cambie Boulevard) and Park Homes (facing Cambie Park and 54th Avenue) and each will be 6 storey mid-rises. The floor plates are excellent as there are only 4 suites per floor on the penthouse level and only up to 8 units per floor on the lower levels which allows for extra privacy for every home. The Boulevard Homes Plan A is a 2 bedroom and 2 bathroom layout with 2 flex areas and a total interior living space of 938 square feet with outdoor living between 100-110 square feet. Floor Plan B is a 2 bed/2 bath layout at 1033 square feet with a flex area and outdoor living between 125-170 square footage. The C Layout is 2 Beds/2 Baths and 831 sqft plus 160 sf outdoor space. For the Park Homes, Plan I is a 2 bed/ 2 bathroom layout at 1,189 square feet plus 60-80 sqft exterior space. The M Plan is a spectacular 3 bedroom plus den and 3 bathroom layout at 1,702 square feet plus 60sf outdoor living. Grand city homes framed by parks on two sides, experienced through high-volume spaces and private outdoor living spaces… sounds fantastic to us! The online marketing also states that the new homes will be unconventionally large, light filled and centrally located along the upper slopes of Cambie Boulevard. The immediate thing that will strike any homebuyers about Cambria Park Vancouver Westside residences is the setting, overlooking the beautiful park/urban green space and bordering along the Langara Golf Course. The presales opening will be on March 19th, so stay tuned for more information regarding the features list, pricing and available floor plans. The project site is located at Cambie & 54th Vancouver. Cambria Park is a six storey, wood frame construction project with concrete in between floors. The exteriors will feature beautiful brick and Hardie-plank and the parkside residences will feature two building with two and three bedroom floor plans. Some of the neighbourhood highlights in this Langara area are Oakridge Centre and the Canada SkyTrain Station. The completion for these beautiful homes is expected to be around summer 2018. There are a total of approximately sixty nine units for sale. It is currently in pre-construction phase with sales launching in Spring 2016. Some of the expected amenities for this project include a concierge, high speed elevators, workout facility, multi purpose room, geothermal heating/cooling system, underground parking and patios. This is according to online sources for presale condos. Cambria Park at South Cambie Vancouver real estate development is one of the most sought after new projects on the West Side for 2016.